Hematology analysis is an important step in medical diagnoses, often determining the treatment that a patient will receive. With a patient’s life on the line, it is vital that these analyses are accurate to the highest degree possible. 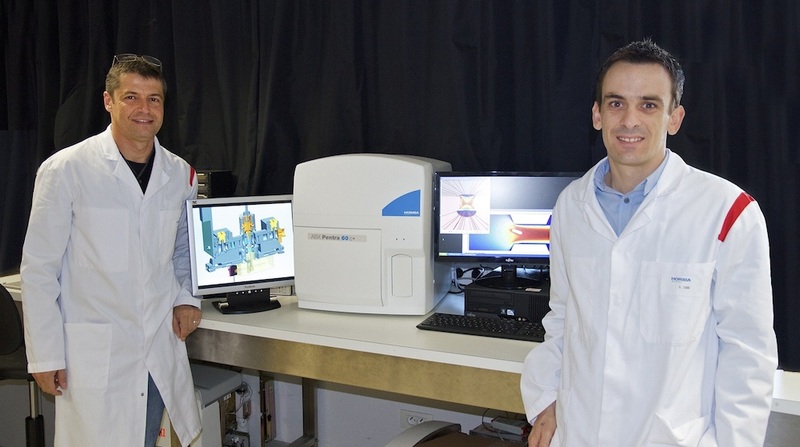 Researchers at HORIBA Medical, a worldwide supplier of medical diagnostic equipment, turned to simulation to develop new methods for optimizing the accuracy of their hematology analysis devices. The resulting technique is currently used in some of their best-selling equipment. On a small scale, using physical testing to improve device performance can be nearly impossible, where actual measurements can be either too expensive or too difficult to obtain. Simulation is a cost-effective and efficient way to overcome this challenge, as it provides engineers with a way to measure and optimize device performance in lieu of actual measurements. Using COMSOL Multiphysics, Damien Isèbe, Scientific Computing Engineer, spearheaded a project at HORIBA Medical to determine how the accuracy of hematology analysis devices could be improved. How do we measure the size and concentration of red blood cells (erythrocytes), white blood cells (leukocytes), and platelets? 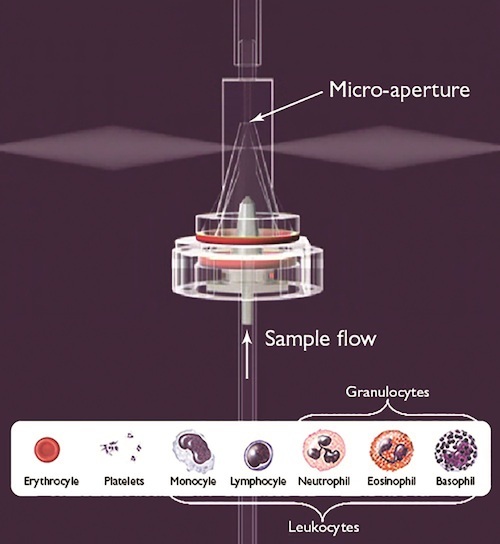 One well-known approach to blood analysis, which is employed by many of HORIBA’s analyzers, uses a combination of optical measurement and electrical impedance to count and size cells as they pass though a micro-aperture electrode system (shown below). The fully-automatic process begins with the placement of a blood sample in an analysis chamber, where it travels through a hydraulic channel and is diluted with reagents. The sample is then sent to a counting and measurement chamber made of a micro-aperture placed between two polarized electrodes. 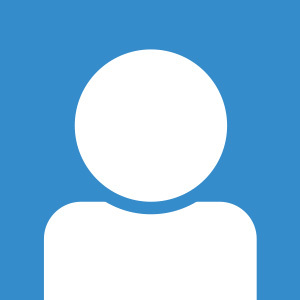 Counting and sizing happens as the particles pass through the micro-aperture and induce a voltage drop of the electric field generated by the electrodes. 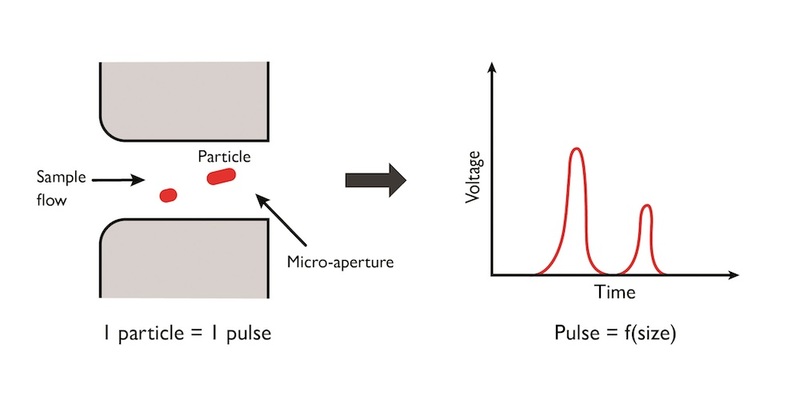 This voltage difference can then be measured and used to determine the particle size, with a greater voltage difference corresponding to a larger molecule. A particle’s orientation through the aperture can also result in inaccurate readings. Electric field distribution through the aperture is different depending on orientation, which can again result in an overestimation of the particle’s size. This is shown in the image below, where the resulting voltage change is measured for a particle passing both horizontally and vertically through the electric field. Using COMSOL Multiphysics, Isèbe explored ways to improve the accuracy of the device. Numerical simulation was used to create a multiphysics model that analyzed the electrical pulses resulting from impedance measurement, as well as particle fluid flow analysis. Isèbe’s hypothesis was that hydrodynamic focusing could be improved by the use of numerical simulation. In the article “Optimizing Hematology Analysis: When Physical Prototypes Fail, Simulation Provides the Answers” from COMSOL News 2014, Isèbe describes how this works. He says, “Hydrodynamic focusing uses sheath flow to control the sample rate inside the aperture and to direct the sample flow along the central axis of the aperture.” This prevents edge effects from altering the results, and helps to align particles to the same orientation. 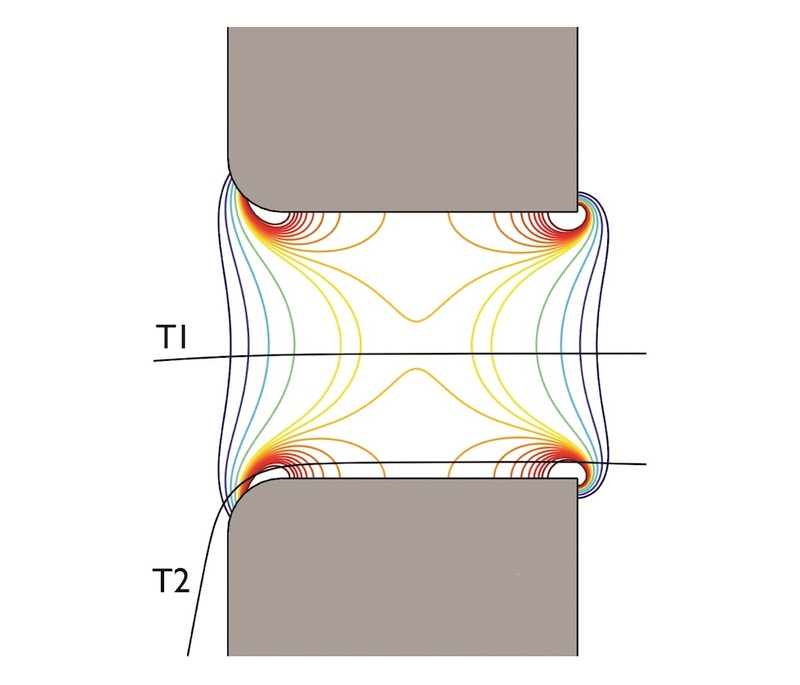 Hydrodynamic focusing simulation showing how sheath flow is used to direct the sample along the central axis of the electrode aperture (sample flow in red and sheath flow in blue). Isèbe used the simulations to compute the velocity field and particle acceleration within the device, and to determine which configuration produced the most accurate results. The analyses were then compared to experimental results, where it was shown that the hydrofocused device is about twice as focused as the non-hydrofocused one. Left: Didier Crémien, Mechanical Project Manager. Right: Damien Isèbe, Scientific Computing Engineer.